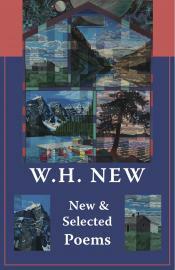 Between 1996 and 2011, W. H. New became one of our most inspiring and innovative Canadian poets with the publication of ten volumes of poetry over a span of twenty years: Science Lessons (1996); Raucous (1999); Stone/Rain (2001); Riverbook and Ocean (2002); Night Room (2003); Underwood Log (2004), which was short-listed for the Governor General’s Award for poetry in 2005; Touching Ecuador (2006); Along A Snake Fence Riding (2007); The Rope-Maker’s Tale (2009); and YVR (2011), which received the City of Vancouver Book Award. The titles alone read like a poem, each evocative of a complex relationship and translation of the world into poetry. The variety and intensity of experience in these ten books is remarkable and the experimentation with form often extraordinary. The temptation is to think of the publication of a Selected as the summation of a poet’s career, as a cataloguing of the poems that "matter" from a lifetime’s work, as a retrospective. In the case of Bill New, nothing could be further from the truth. What we have in this selection is a book that speaks to the poem as movement and revelation, as process, never ending. This Selected, ten titles later, is a work in progress, a celebration of poems spoken and yet to be spoken.